As I write, it’s October, spring, and the bushfire season has already begun. An El Nino event over the Pacific Ocean, likely to be one of the most powerful on record, is contributing to above-normal fire risk over large areas of southern Australia, especially along the east and west coasts. Over the past decade, eastern Australia, the west coast, and Tasmania have recorded significantly below-average rainfall; once temperatures begin to rise–and we’ve already set temperature records this month–whatever moisture is left in the soil will quickly evaporate, leaving forests and grasslands dry and ready to burn. Tasmania, Victoria, and New South Wales are likely to have severe bushfire seasons. Homes in central Victoria have already been lost. Closer to my home in Victoria’s Western District, locals are beginning to look at the months ahead with a kind of quiet dread. This is true in the Grampians in particular, where bushfires have raged fiercely in recent years. You can stand in the main street of Hamilton, looking roughly northeast, and see the Grampians crouching on the horizon, their jagged silhouette stained in blue and purple. It’s easy to take them for granted if you’ve lived with them your whole life. Sometimes you need to see the world before you can appreciate your own backyard: John Bechervaise was a worldly man–a writer, artist, historian, photographer, and Antarctic explorer–but he was still in awe of his home country when he returned. ‘The Victorian Grampians will never cease to be surprising,’ he wrote in his Grampians Sketchbook in 1971. This area is also known as Gariwerd, and is one of the most significant Aboriginal places in Victoria. It contains the largest concentration of rock art sites in the state, and the Mount William and Tolendo swamps show evidence of an extensive land management system of eel and fish traps. At the Brambuk national park and cultural centre just out of Halls Hap you can learn about Gariwerd’s place in Indigenous cosmology. The Jardwadjali and Djab Wurrung peoples, who have lived here for at least 20,000 years, say that these mountains were part of the dreaming of Bunjil and the two Bram brothers, buledji Brambimbula, who were responsible for the creation of the mountains, rivers, flora, fauna, and laws of central and western Victoria. In the Dreamtime, one of these creators–Bunjil–dwelled inside a small cave in what’s now called the Black Range State Park near Cavendish. The Grampians are the western extremity of Australia’s Great Dividing Range, and consist in four spectacular ranges running north-south–the Mount William Range, Serra Range, Victoria Range, and Mount Difficult Range–which at some points rise over a kilometre above the basalt plains of the Western District. The entire region was once a great inland sea. Earth movements starting some 400 million years ago lifted and folded the land, exposing layers of sediment, siltstone, and mudstone to the weather. The erosion of sandstone over millions of years formed the most dramatic ranges, but you can also see granitic rock–pushed to the surface 350 million years ago by magma deep below–in hills and outcrops around Halls Gap, Wartook, and Mafeking. The igneous rocks thrust up by the same processes are rich in nutrients. When the Wonderland Trail passes by these areas, the vegetation transforms from low scrub and heath to taller, more confident trees. The creators gave Gariwerd six seasons for the Jardwadjali and Djab Wurrung people to live by: gwangal moronn, the season of the honey bees, in autumn; chinnup, the season of the cockatoos, in winter; larneuk, the season of nesting birds, in early spring; petyan, the season of wildflowers in late spring; ballambar, the season of butterflies in early summer; and, in late summer, kooyong, the season of eels. The lives of the Jardwadjali and Djab Wurrung people have been closely tied to this cycle for millennia, and anybody who has lived in the area knows that the four European seasons are not enough. As M. F. Peron, the French scientist, wrote in 1804, ‘the mind is astonished and can only wonder at this inconceivable fecundity of nature, which supplies so many climates with productions peculiar to each, and which at the same time are always so rich and beautiful.’ He was speaking of southern Australia more generally, but he could have been referring to the Grampians in particular. The ranges lie north-south in the path of westerly winds that bring plentiful rain; the highest peaks historically record about 1000 millilitres of rain annually, but if you travel just moments west to Horsham, the annual rainfall is less than half of that. The northern Grampians are warmer and drier than the southern end of the ranges. Some parts of the park where lush fern forests grow, however, are almost permanently wet. The rocky slopes in other areas retain almost no moisture, and surrounding vegetation has adapted to cope with a lack of water and nutrients. On the higher peaks, such as Mount William, ice and snow are common in the colder months, while low-lying areas like Victoria Valley are prone to flooding. A few years ago, rainfall was so heavy that landslips cut long, deep scars into some of the southern slopes, blocking the road to Halls Gap–you can still see these scars as you drive west along the Glenelg Highway. The Bram brothers gave Gariwerd plentiful flora and fauna, too. In October, spring wildflowers bring the ranges to life: Blue Pincushion lilies, Grampians Parrot-peas, Grampians Boronias, Grampians Thryptomenes. There are some plant 800 species recorded there, and over 40 of them are only found in this part of the world. A long drive in the Grampians will take you through fern gullies, stringybark forests, red gum woodlands, heathlands, and swamplands. This diverse vegetation supports an equally rich animal population–grey kangaroos, possums, gliders, echidnas, koalas, red-necked and black wallabies, and an abundance of birdlife, including mobs of roaming emus and laughing kookaburras. Although the ranges themselves will last for millions of years more, the Grampians’ flora and fauna are under stress, and the six seasons are not as reliable as they once were. A group of scientists completed a study this year and found decreases in the populations of many species, including small mammals such as swamp rats and native heath mice, and larger marsupials such as the southern brown bandicoot and quolls. The research is showing that these native species are not coping with extreme weather in a long-term low rainfall environment–the whole system is affected, from plants to insects to animals, and it’s a worrying sign of things to come. It’s a trend particularly exacerbated by bushfire. After fire has hit the area, local wildlife shelters are inundated with casualties. Many of them have been seriously burnt, and many die of their injuries. Photos of cute, sad, orphaned joeys in nappies are shared across social media–but many of them die too, eventually. They’re either too far gone, or there’s not enough staff and supplies to give them proper care. Volunteering at a wildlife shelter can be a difficult job–you have to be comfortable euthanising many of your patients. Other animals flee the bush and find their way onto the main roads, becoming roadkill or snagging themselves on barbed-wire fences. They follow the railway lines too–it’s not uncommon for wallabies and kangaroos to take up residence in the backyards of houses in town. The bushfires contribute to population decline across a variety of plant and animal species, but these usually recover over time. Fire has been central to the ecology of the Grampians’ flora and fauna; it has a kind of regenerative power. You can travel through bushfire affected areas and see the habitats coming back–large sections on the road to Halls Gap from Dunkeld were, for a long time, bordered by almost nothing but blackboys and burnt eucalypts covered in fuzzy, bright green re-growth. The red gum forests of Victoria Valley were much the same after some more recent fires. It’s a hopeful sight, and a process built into the area’s ecology. In many ways, the flora and fauna of the Grampians need fire. In some parts–and it’s a story replicated across the country–the whole process is becoming disrupted due to longer-term environmental and climactic changes. There’s not enough rain, and bushfires are burning with much greater frequency and intensity than they used to. Mammals and their habitats are under serious stress; more frequent extreme weather events aren’t helping. At one point last summer, like many summers before it, standing in the main street of Hamilton you couldn’t see the Grampians through the smoke. But the Grampians are no stranger to fire. The Scottish explorer Thomas Mitchell, who was one of the first Europeans to set eyes on Gariwerd, observed in 1848 that ‘Fire, grass and kangaroos, and human inhabitants, seem all dependent on each other for existence in Australia, for any one of these being wanting, the others could no longer continue.’ The first Australians came to a continent tolerant of fire and transformed it into a world with a preference, almost an addiction, for fire. The Indigenous Australians were a fire people. At about the same time Mitchell remade this landscape as a noble Scottish mountain range and renamed it the Grampians, an alliance between humans and fire came undone. Only now are we starting to reforge this partnership. We live with bushfire in Australia; it seems part of the natural rhythm of the land and the seasons, though ever since the trauma of Black Saturday in 2009, and the collective grief we experienced over that tragedy, we’ve grown increasingly cautious about it. How much, however, do we really know about fire, its place in Australia, and its relationship with us and of us with it? Loved or unloved, wanted or unwanted, writes American historian Stephen Pyne, ‘fire takes its character from its context. It is what its circumstances make it. Those circumstances are largely biotic, pruned by considerations of terrain and weather, and increasingly, they are cultural…For, while fire has existed on Earth for at least 420 million years, its geography and dynamics have, over the course of the Holocene, aligned more and more closely with those of Homo sapiens.’ In Australia, the history of fire has been intimately related to human cultures both before and after European colonisation: humans have made Australia a continent of smoke. Over 70 per cent of southeast Australia’s natural environment has been modified since Europeans arrived in 1788. It’s therefore tempting to follow the lead of a group of historians of empire and ecology who contrast environmental damage at the hands of European settlers with the innocence of indigenous peoples and their environments. Visions of ‘Merrie Australia’ and other settler societies are central to reading the ecological past as, in the words of one historian, ‘one long free fall, with imperialism as its global accelerator.’ This apocalyptic thinking is, however, ahistorical, and a kind of romantic primitivism: no society, culture, or people can claim to have ever had a monopoly on ecological sanctity. Ideas about a pristine ‘wilderness’, so popular with an earlier generation of environmentalists, both fail to understand ecological change over time and ignore the human element of Australian ecological systems, in particular downplaying the active role Indigenous Australians had to play in changing the landscape. European colonialism changed the land, for certain, but it was being transformed–in a different way–well before that. The building of a fence between Indigenous Australia and European Australia disrupts the story of fire: we’d do well to remember that, in the case of fire, we have always lived within ecological systems, not outside them. The presence of fire is one of the remarkable constants in European descriptions of Australia in the late eighteenth and early nineteenth centuries. ‘We saw either smoke by day or fires by night’, wrote James Cook as the Endeavour sailed past the eastern coast of Australia in 1770. These first settlers and all those who followed would come to learn that the Australian climate is hot, dry, and prone to drought. The entire country is susceptible to severe bushfire conditions. Summertime cold fronts bring strong winds to the dried-out forests and grasslands in the southeast. If spring has been wet, the abundant growth only provides more fuel for late-summer fires. In New South Wales and southern Queensland, deep low pressure systems off Tasmania bring strong north-westerly winds, creating severe bushfire seasons after dry winters and springs. In the southwest, when the winter rains have ceased and vegetation has dried up, the greatest threat comes in late spring and early autumn from the hot air moving down from the Pilbara. In northern Australia, fire season is in the dry, sunny winter and spring months when hot air from the deserts of South Australia move northwards. When the natural cycle of warming in the Pacific Ocean produces El Nino events, drier conditions and more extreme temperatures heighten the fire risk across all of northern and eastern Australia. Fire has been part of Australia’s ecological systems for millions of years. Few Australian plant species aren’t adapted to it. Many have evolved to promote fire, such is its importance to their life cycles. The ubiquitous eucalyptus is a case in point. When a bushfire comes through, the oil-rich leaves of eucalypts burn quickly and intensely, allowing sunlight to reach the understorey and creating space for new growth. Fire triggers the release of seeds, which drop into the warm, nutrient-rich ash soil now free from competing plants, while grazing animals, having fled the fire itself, stay away for enough time to allow new vegetation to establish. Eucalypts have a complex and dependent relationship with fire. Some young eucalypts have what are called lignotubers, swellings near ground level that contain a mass of buds, protected and hidden away just in case seedlings, saplings, young trees are damaged again by fire or animals. Other eucalypts have buds on their trunk and branches, protected by an outer layer of bark, that only sprout when wildfire damages their crown. You can see this fuzzy, bright green growth if you travel through a burnt-out eucalyptus forest a few months after the fire. Many species shed their bark easily, providing bushfires with more fuel when they occur; swamp gum bark hangs in long ribbons that catch fire easily and can float long distances on the wind. The eucalyptus reminds us that this continent, as the Rev. John Ramsden Wollaston put it in 1841, is ‘a wonderful depository of fire’. It’s long been argued that, before European arrival in the late eighteenth century, Indigenous Australians modified their environments, intentionally and unintentionally, by fire. Both European ethnohistorical accounts and knowledge of the use of fire in traditional Aboriginal communities suggest that fire was primarily used in hunting. Systematic, selective burning also promoted the growth of fire-resistant and fire-tolerant vegetation, and attracted more mammals, such as bandicoots and wallabies, and smaller animals still. The Indigenous fire and land management regimes ensured abundant wildlife, plants, and foods. They also decreased fuel loads–grasses, smaller shrubs, dead trees and branches–likely reducing the intensity of seasonal bushfires. Indigenous Australians therefore transformed, managed, and manipulated the Australian landscape to meet their own needs, and there’s evidence that this occurred over many thousands of years. To the nineteenth-century Europeans, fire was a threat. It could destroy their land, their livestock, their homes, and it could take their lives. As the European settlement of Australia and its peoples went on–often into areas cleared already, it seems, by bushfire–the Indigenous fire and land management regimes ceased to operate. Europeans used the land differently. The controlled burning stopped, and dense, ground level vegetation returned where it had not been in 1788. With changes to flora came changes to fauna, and many animal populations had declined or disappeared by the middle of the nineteenth century. Along with the cessation of fire regimes–allowing scrubby, low-lying bush and grassland to establish itself where it had not been before–fuel loads increased, and, when weather conditions were right, so did the intensity and frequency of bushfires. 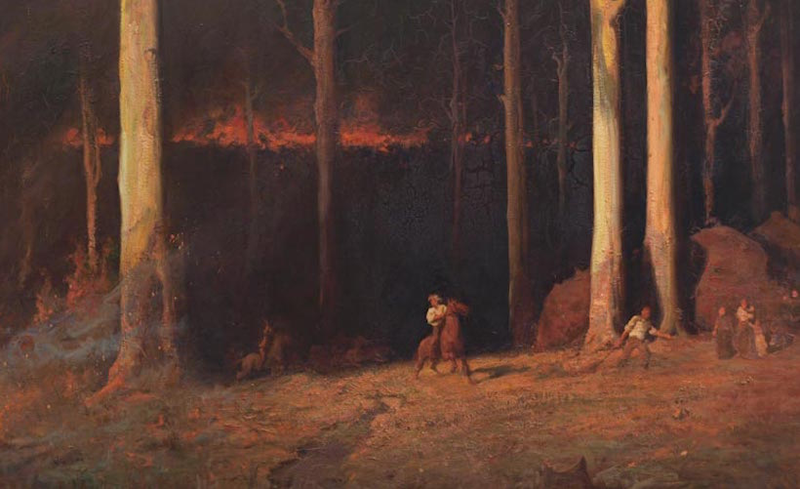 Other elements of nineteenth-century European settlement altered Australia’s fire regimes, too: in areas where the land was cleared for grazing, the frequency of fire increased, and in areas of urban development, fire was suppressed. The overall affect was that fires in post-European Australia were less frequent, but more intense, and more destructive. A long truce between humans and fire in Australia was broken. In the last century and a half, hundreds of people have died, thousands of homes have burnt, millions of animals have perished, and vast swathes of agricultural land have been destroyed. On Black Thursday in 1851, fires in the Plenty Ranges, the Wimmera and Dandenong areas, and around Portland, covered five million hectares of Victoria, about a quarter of the state, and took 12 lives and killed one million sheep. The fires also cleared away the grass and bush, exposing gold in the ground underneath, and likely facilitating the Victorian gold rushes, bringing hundreds of thousands of migrants to Australia. It was one of the first large bushfire events of post-European Australian history. On Black Friday in 1939, 71 lives were lost in Victoria. In Tasmania in 1967, a bushfire killed 62 people. In the Blue Mountains and coastal areas of New South Wales in 1968, 14 people died. The next year in Victoria, 23 perished in fires. In severe drought conditions on Ash Wednesday in 1983, when temperatures reached 43°C, 76 lives were lost in fires that raged in South Australia and Victoria. In 1994, fires in New South Wales consumed 800,000 hectares of land, encroaching into Sydney suburbs and burning in 40 national parks. In January, 1997, over 250 fires burnt across Victoria; 40 homes were destroyed in the Dandenong Ranges near Melbourne. The worst bushfire disaster this far in Australia’s post-European history occurred on February 7, 2009, in Victoria. Temperatures in Melbourne reached 46.4 °C, and winds were blowing at 100 kilometres per hour by the middle of the morning. By evening, 400 individual fires were burning across the state. The Black Saturday fires killed 173 people and injured another 414. They burnt some 450,000 hectares of land, destroyed over 2000 homes, and displaced over 7500 people. When it was revealed that at least some of the fires were set deliberately, the Prime Minister Kevin Rudd described it as ‘mass murder’. It’s not as though the Europeans and their descendants have merely looked on, helpless, as fires raged around them. In modern times, Australians have attempted to enact their own fire regimes, and sometimes disastrously. Forests are a case in point. In the first half of the twentieth century, forestry and forest management motivated efforts to suppress and exclude forest fires, which allowed dense, flammable vegetation–kindling, in essence–to accumulate in areas that would’ve once been cleared regularly by low-intensity fire. Some of the worst fires in the middle of the twentieth century were the result of these policies. From the 1950s and 1960s, prescribed burns–hazard reduction fires–replaced outright exclusion and suppression. In the second half of the twentieth century, with an invigorated environmental movement, focus turned to the conservation of forests and the protection of biodiversity within them. Owing to the pressure of protest and lobby groups, prescribed burning became limited to areas where reserves bordered developments or agricultural land. In some forested areas, this has resulted in the formally open, grassy understorey–where fires used to burn often–becoming thickly vegetated with dense shrubs, sometimes to the detriment of surrounding eucalypts. The other impact of this is that, when bushfires occur in these forests, the fires are larger, burn more intensely, and are more difficult to control. The ‘wilderness’ myth of Australia’s previous generation of environmentalists has proved to not only be historically and culturally deficient, but has also had dire implications for our physical world. Tom Griffiths has recently called for environmental histories that ‘guide and strengthen us’–or, in Stephen Pyne’s words, provide us with ‘the intellectual equivalent of ecological regeneration’. The history of bushfire on this continent offers the chance to explore these possibilities–it’s a history that weaves deep time with human time, unsettles anthropological nature-culture divides, and gives scope to answer the question, ‘What happened to this land after the Europeans arrived?’, without romanticising what came before. What, then, can our fire history teach us? The most important thing environmental histories can reveal is not so much the extent of damage done, but how much damage is sustainable. Fire, we must understand, brings a kind of creative destruction to the Australian landscape. It’s a force that must be tamed–but this is becoming harder. Over the past three or four decades in Australia, temperatures have risen and rainfall has decreased. The dry, windy days that–along with long grass and scrubby vegetation–lead to bushfires, are increasing. With suitable weather for fire becoming more frequent, it’s beginning to seem like there have been bushfires in the Grampians during every season. Even now, however, the design of fire regimes is hindered by a lack of knowledge of what kind of damage ‘works’. There are so many variables and ecological responses to fire that it’s difficult to extract general principles. What’s effective in the Otways or the Blue Mountains might not work in the Grampians. The story of Indigenous Australians and fire, however, provides a source of hope: we can change and control the environment, so long as we know what we’re doing. Indigenous Australians knew what they were doing, it seems. Europeans, we must accept, did not–not until very recently. The story of colonialism shouldn’t motivate lamentations for an imaginary pre-colonial wilderness, but rather should drive us to gather more and better knowledge of this vast continent’s diverse ecologies. What we know now is that Australia needs fire, and that it’s the combination of weather, land use, and fire practices that affect the nature of our fires. Increasingly, then, ecologists are attempting to understand the effect of fire on local and regional landscapes, to design fire regimes that do not assume that fire and biodiversity are mutually exclusive They are raising concerns over what Pyne has called ‘exurban colonization’ of rural land, and considering more carefully how state-owned nature preserves are managed. Ecologists are also taking lessons from the varied, low-intensity fire regimes–the firestick farming–of Indigenous Australians. Benjamin Wilkie is a lecturer in the School of Humanities and Social Sciences at Deakin University.